AMD has released what it is calling one of its biggest and most significant driver releases ever. The new Radeon Software Adrenalin Edition introduces an all-new in-game overlay with performance information such as the current performance in frames per second, CPU, GPU and RAM usage as well as temperature, power consumption and fan speed for the graphics card. Users will also be able to adjust per-game Radeon settings such as Freesync and Target Frame Rate Control, and make colour adjustments. 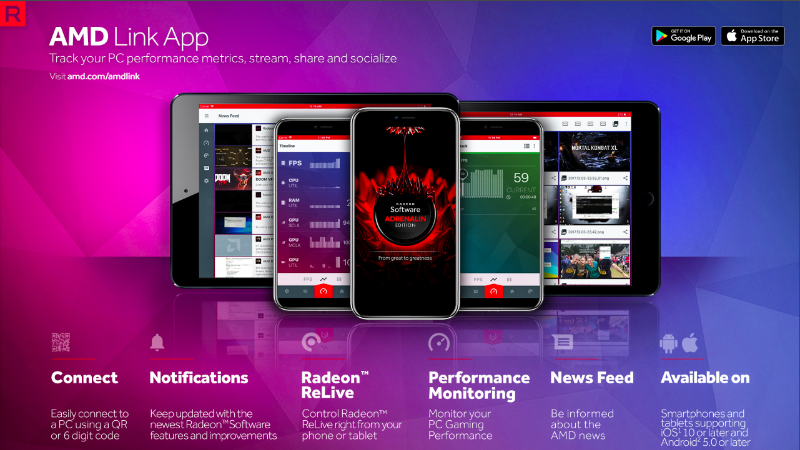 There’s also now a companion app called AMD Link for iOS and Android, which can be paired with multiple gaming PCs. It will show the same information in real-time, as graphs or as absolute numbers. Users can trigger screen captures, start streaming, and adjust settings using their smartphones as a second screen. 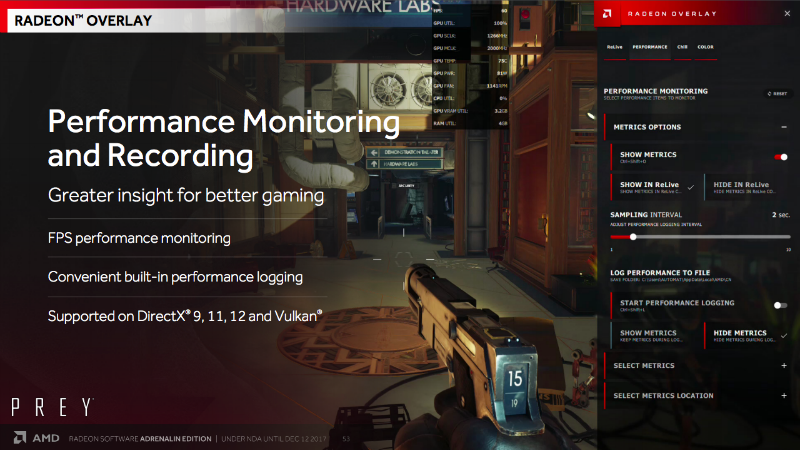 The Radeon ReLive streaming tool, which headlined last year’s big driver release, has received several feature updates. A new Gallery tab within the Radeon Settings software will let users quickly manage their social media accounts and choose what to share with one click. Video clips and screenshots can be given quick edits before they are shared. ReLive now supports chroma keying for webcams, so users can superimpose just their heads in a stream without any distracting background. Audio tracks for commentary can be recorded separately and levelled, and social media chat streams can be embedded as well. AMD says that ReLive’s performance impact has been reduced to near negligible levels in many games. It now works with games using the Vulkan graphics API, and users can capture across multiple monitors or even select regions of a screen to capture rather than the entire thing. The Radeon Chill tool, which dynamically regulates frame rates to save power when there isn’t much action on screen, has been improved to work with all games, not just a handful of whitelisted ones. According to AMD there are no major glitches or performance drops in any games, but it can disable the feature for specific titles if problems are detected. The feature is still opt-in, except in a special edition of the driver software for gaming cafes which prioritises power savings. In other miscellaneous improvements, Radeon users will be able to create and share profiles for the WattMan power management and overclocking tool, change the colour scheme of the main Radeon Settings interface, and switch to a compute workload profile that boosts performance in tasks such as cryptocurrency mining by 15 percent. Of course there are also performance improvements in games, though AMD says that we should not focus on this as improvements are delivered constantly, never reserved for large releases.